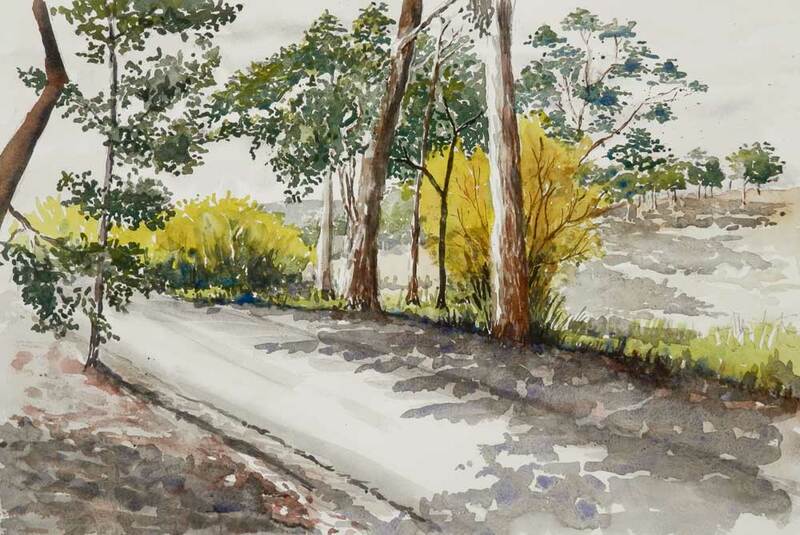 Our recent trip to Adelaide resulted in a fair number of small pen and ink sketches, a couple of small watercolour sketches and the picture above painted of the road outside “The Cedars” which was the long time home of Sir Hans Heyson who was one of Australia’s formost painters. My partner and I were holidaying with a group from the Rangiora Art Society and while a few sketches were done by most of us the trip was mostly just a great opportunity to socialise and holiday with friends. Following on, closely, after the trip we had the Rangiora Creative Arts (sponsored by Prosser Quirke a local accounting firm) exhibition. I’m lucky (?) to chair the organising committee which runs this annual show which displays and promotes the work of several, Rangiora based, groups. This show was held in the Rangiora Borough School hall for the first time this year and all attendees seemed to enjoy the new venue. I’m currently working on paintings for the Kaiapoi Arts Expo and the Town and Country Society Society of Arts show both of which run in July. The above painting will be shown at Kaiapoi along with some more work resulting from my time in the Netherlands. Watch out, I’ll be posting the images here as they are completed.